This chapter presents the background for the book. Our point of departure is a distinction between occurrences (contingent things that take place in the world) and events (discursive constructions that make sense of occurrences). This chapter opens the central trajectories that come together in our attempt to explain how the triple disaster on 11 March 2011 in Japan was made sense of. 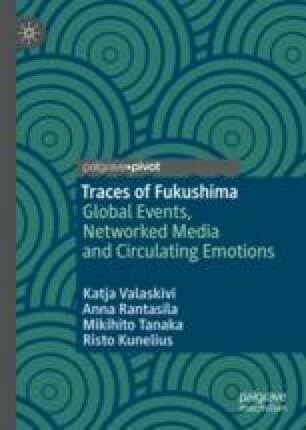 This chapter suggests that the meanings, affects and articulations are linked to four intersecting discussions, looking at the event (1) as a dramatic example of processing cultural trauma, (2) as a disruptive global media event that unfolds in (3) a new kind of hybrid media environment, and that carries with it the exceptional political and cultural tensions related to (4) nuclear politics. Liebes, T., & Blondheim, M. (2005). Myths to the rescue: How live television intervenes in history. In E. W. Rothenbuhler & M. Coman (Eds. ), Media anthropology. London: Sage. https://doi.org/10.4135/9781452233819.n18.